Every piece of Marco Bicego jewelry is possessed of an iconic sense of style, and no other designer’s work can be mistaken for it. Long traditions of Italian craftsmanship meet with international inspiration, handmade warmth, and an outré sense of creativity. Here at Lewis Jewelers, we’re pleased to be able to bring Marco Bicego jewelry to our customers, and with every type of fashion jewelry represented by numerous collections and styles, we know that you’re sure to find the right piece to dazzle your sensibilities. Find the right fashion rings, earrings, bracelets, and necklaces at Lewis Jewelers. The Masai collection of fashion rings was inspired by the traditional woven and beaded jewelry of the Maasai people of East Africa. Brightly colored and layered hoops turn into the multi-tone, multi-band offerings of the Masai collection. 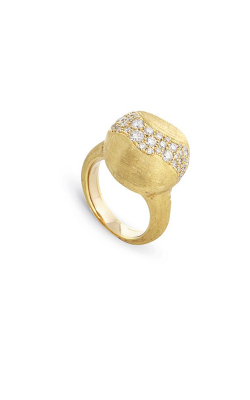 The luxurious 18k gold is patterned in such a way as to resemble beads, and many of the fashion rings boast fiery, asymmetric diamonds that resemble beads. The Paradise collection of earrings has a very minimalistic look, with its richly saturated and multi-hued gems suspended by thin gold chains. Returning to Africa, the Cairo collection of Marco Bicego necklaces is inspired by the breathtaking jewelry of the ancient Egyptians. These wide necklaces are made from a shimmering interplay of gold strands, creating the appearance of a “collar necklace” around a woman’s neck. When it comes to bracelets, check out the Lunaria collection, made of asymmetric gold beads that have been brushed to create the effect of seeing the Moon on a hazy autumn night. Several of the pieces include cool blue moonstone and midnight lapis lazuli. Why Shop for Marco Bicego Jewelry at Lewis Jewelers? For the women of Ann Arbor, Michigan, Lewis Jewelers is the place to go to find Marco Bicego jewelry. 80 years of experience has given us the taste necessary to bring our customers the height of luxury. In addition to Marco Bicego, we showcase other fashion jewelry brands, as well as designers of engagement rings and wedding bands. If you’re searching for Swiss-quality timepieces, GIA-certified diamonds, or colored gemstones, Lewis Jewelers is here to help as well! If you’re interested in our jewelry and services, contact us at 734-994-5111 or visit us today at our Ann Arbor, Michigan showroom.